SEOUL -- South Korea's top biosimilar firm Celltrion partnered with iProgen Biotech, a Canadian biotech company, to develop an antibody-drug conjugates (ADC) platform that could treat breast cancer patients and target other tumor antigens. ADC is an important class of highly potent biopharmaceutical drugs designed as a targeted therapy for the treatment of people with cancer. The platform is intended to kill only cancer cells and spare healthy cells. Celltrion has searched for novel technologies that could expand the use of antibody therapeutics and produce new biotherapeutics. Celltrion said Monday that it would manufacture and supply four recombinant antibodies to iProgen while supporting chemistry, manufacturing and control (CMC) activities for an investigational new drug (IND) application and clinical trials. iProgen would conduct the first stage (Phase-1) clinical trial. Celltrion has the right of first negotiations on drug candidates for global in-licensing if the clinical trial is completed. The company said the antibodies encompassing iProgen's proprietary delivery technology is expected to increase anti-tumor efficacy by enhancing drug delivery and internalization to cancer cells. 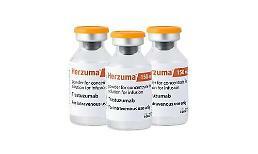 Celltrion's biosimilars include Herzuma, based on Herceptin developed by Genentech, a subsidiary of Swiss pharmaceutical giant Roche. Truxima, the first biosimilar to Rituxan (rituximab), treats patients with non-Hodgkin's lymphoma, chronic lymphocytic leukemia and rheumatoid arthritis.